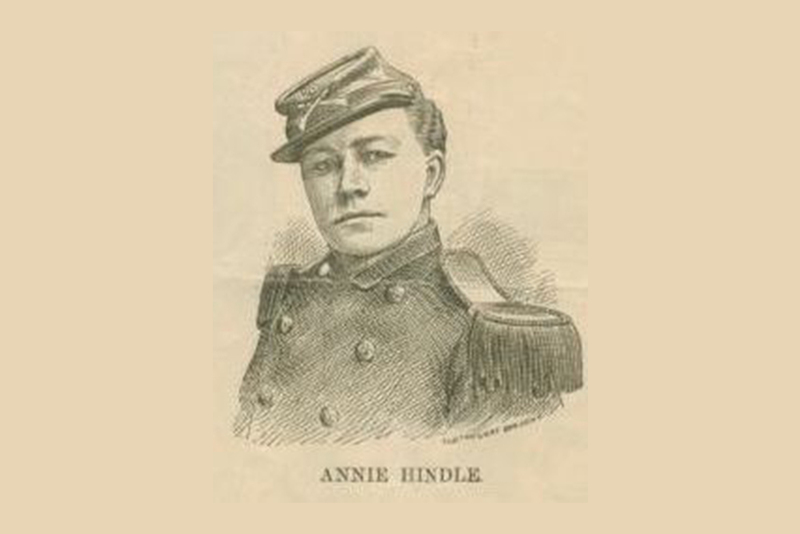 A sketch of cross-dressing performer Annie Hindle, sporting a man’s Union Army uniform. Courtesy of the The New York Public Library Digital Collections, via Wikimedia Commons. On June 6, 1886, Kerr B. Tupper, a Baptist minister in Grand Rapids, Michigan, presided over the marriage of a young couple. The groom gave his name as Charles E. Hindle and listed his profession as “actor” on the marriage license. The bride’s name was Anna Ryan. The marriage was not the first for the groom, although there was no indication on the license that he had been married before. There was also no indication that Charles Hindle was, in fact, not an actor, but rather British-born actress Annie Hindle, who by that time had performed on the American stage for close to 20 years as the country’s first male impersonator. Unsurprisingly, Hindle’s union with Ryan was soon breathlessly revealed in the pages of a local scandal sheet after a reporter hounded the newlyweds, first in a restaurant and then at the hotel where they stayed. Hindle strung the reporter along with feints and denials but the report, published the morning after the wedding, caused a furor in Grand Rapids and beyond. 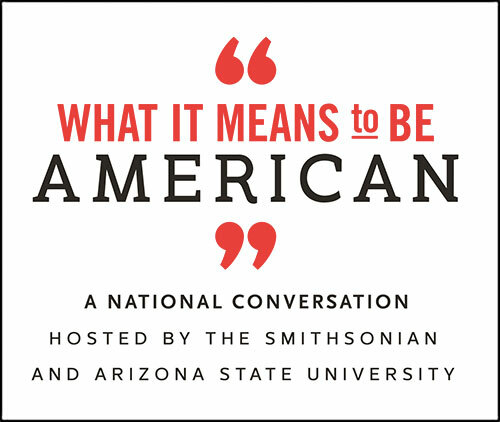 The scandal marked a collision between two segments of American culture with very different standards: respectable, church-going 19th-century townspeople, and the theater performers who entertained them—a group that maintained its own standards of decency, centering on a shared sense of professionalism and kinship, and a greater tolerance of behavior that would have caused scandal in wider society. Notably, though, Annie Hindle’s marriage to another woman didn’t end her career—she would go on to perform for another 20 or more years, and even married another woman later in her life. Protected by fans who flocked to her shows and by theater colleagues who prized her talent and professionalism above all else, Hindle thrived in an America that, even in the 19th century, had at least some room for diverse views and values. Then as now, the theater was a community of artists that quietly hummed along—making audiences laugh and making money—as it challenged the moral climate of its time. Hindle’s remarkable life was enabled by the particular characteristics of the lives of theatrical performers in the 19th century—whether they did high theater or low comedy, many were itinerant, traveling from town to town, either alone or as part of a troupe. This was as true for stars of the dramatic stage, such as Edwin Booth or Kate Denin, who took leading roles in upper-class theaters all over the United States and the world, as it was for variety and circus performers such as Hindle. The audience for variety shows was working-class men, who were then thought of as disruptive and sometimes violent. Variety shows filled their entertainment needs, offering a broad range of singing, dancing, and comic acts depicting an equally broad range of characters drawn from the world of working-class Americans. The shows offered social critique and inscribed social order through humor and parody. The characters in the shows included caricatures of racial and ethnic groups, the old, the young, male and female, working-class and upper-class. The reputation of these rowdy male audiences might have been exaggerated, but it’s clear that these men expected entertainment that engaged them and spoke to their experiences, desires, and aspirations. And they were among Annie Hindle’s biggest fans. Hindle was the first male impersonator in American variety entertainment. She began performing songs in both male and female character in the early 1860s in British music hall, a popular form of Victorian entertainment. Each of Hindle’s songs centered on a different character, and she performed rapid changes of costumes in the wings between songs. She emigrated to the United States, along with her mother, in 1868. Once in America, Hindle eliminated the female characters from her English repertoire. While young women performed both male and female characters in British music hall, this was not the case in American variety entertainment, where women portrayed young, attractive female characters. In choosing to exclusively portray male characters, Hindle created a unique act. Hindle was only around 20 years old, but she impersonated mature men, singing songs about courtship and advising the men in her audience on matters of love and marriage. She also performed songs that encouraged class solidarity and sharing scarce resources when the times were tough. In between songs, as she had in England, she performed rapid changes of costume in the wings. And her costumes represented the finest in men’s fashions, particularly when she depicted an upper-class man-about-town who could enjoy the finest wines, cigars, and other expensive leisure goods. Hindle was an immediate hit with American variety audiences, who were astonished at the realism of her act. She sang in a low alto range, and she could improvise comic monologues that interrupted songs in a manner similar to male comic singers of the era. She appeared to perform some kind of magic on the stage, transforming herself in ways that made her indistinguishable from male performers. In a period in which women were seen as being fundamentally different from men, Hindle blurred gender lines, causing confusion and wonder. She exploited the public knowledge that she was a woman when she performed upper-class characters, depicting them as effete and failing to meet working-class standards for manhood. Carte-de-Visite of the male impersonator Ella Wesner in one of her identities as a “sporting” young man, circa 1872-75. Courtesy of Wikimedia Commons. Hindle quickly became one of the highest paid variety performers, joining a small group of men and women who could demand $100 a week for their services in a period when typical performers made less than half that. She was so successful that several actresses who had begun their careers as dancers, including Ella Wesner and Augusta Lamareaux, adopted her specialty. Within two months of arriving in the United States, Hindle met and married the English comic and ballad singer Charles Vivian, now best remembered as one of the founding members of the fraternal order, the Benevolent and Protective Order of Elks. Hindle and Vivian both performed comedy and sang similar repertoire, though she was better known for her comic characters than her singing, and he was renowned for his fine voice. After the wedding, the pair began to work and travel together, with Vivian acting as Hindle’s agent. Their marriage lasted only about a month. Hindle later claimed that Vivian, who was a heavy drinker with a hot temper, had beaten her. Hindle found a new agent and pursued a career in variety as a solo act, traveling alone. In November and December 1868, while performing an extended run at the Opera House in Baltimore, she met the jig dancer Nellie Howard, and in late December the pair traveled to Washington, D.C., where they were married. The record notes that Hindle gave the name Charles. The women traveled and worked together for the next six to eight weeks, performing at the Varieties Theater in St. Louis during February 1869. There is no evidence that they ever performed together again. It is not clear when their marriage ended, although Hindle published a poem in June 1870, “Parted,” that could be interpreted as a commentary on the end of a relationship. In November 1870, records show that Hindle traveled and worked with a young female singer, Blanche Du Vere, whom she married in Washington, D.C., when both were performing at the Metropolitan Hall in that city. Once again, Hindle used the name Charles E. Hindle. Du Vere soon married James Porter, the business and stage manager at the Metropolitan Hall, in August 1871. 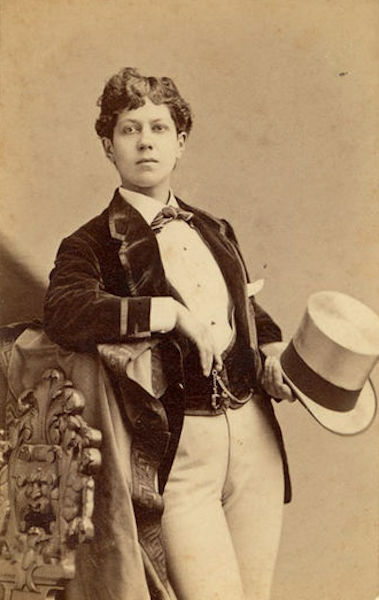 By 1872 she had launched a career as a male impersonator using the name Blanche Selwyn, with Porter acting as her agent. Hindle’s record of failed marriages, and the deceptions she was willing to commit in order to marry, may reflect the loneliness and dislocation of life on the road for an immigrant performer. By the time she married Anna Ryan in 1886, Hindle was completely alone in the country; her mother, who had lived in Jersey City, New Jersey, had died in 1884. Hindle was only around 20 years old, but she impersonated mature men, singing songs about courtship and advising the men in her audience on matters of love and marriage. Even after the short-term scandal of Hindle’s marriage to Ryan, theater managers continued to book Hindle because they knew that she was a reliable performer whose skills on stage pleased her audience. The marriage scandal did not even disrupt the troupe’s tour. Indeed, Hindle’s popularity with audiences meant that, despite her colorful personal history, she was able to remain steadily employed into the early 20th century. When actresses in her troupe were asked by the press about her marriage or her gender, they denied any knowledge of it but expressed shock that such a thing could happen. And yet they continued to work with her on the stage, suggesting that they gave the newspaper reporters the reaction they knew that readers expected. Hindle and Ryan were married for five years; when Ryan died in 1891, the New York Sun covered her funeral, and a number of theatrical professionals attended. Hindle almost immediately sold the New Jersey home they had shared and went back on the road. Within a year, newspapers carried reports of her marrying another young woman, Louise Spangehl, in Troy, New York. Hindle’s new wife took her last name, and the two performed together in small-time vaudeville, sharing the stage in Virginia in 1894. As had been the case even in the 1860s, Hindle’s private life was not an issue in the world of theater as long as it did not interfere with her on-stage act. Her offstage life, and who she chose to make a family with, was none of their business. Gillian Rodger is Professor of Musicology and Ethnomusicology at the Peck School of the Arts at the University of Wisconsin-Milwaukee. She is the author of Just One of the Boys: Female-to-Male Cross-Dressing on the American Variety Stage.